The Big Muddy National Fish and Wildlife Refuge, a "string of pearls" of Missouri River bottomland, was started in 1996 with land purchased from willing owners who gave up farming the bottoms after the 1993 and 95 floods. It has now grown to 8 distinct units across the state of Missouri encompassing 11,207 acres. With the potential of 6 more units being added this year, it may grow to more than 18,000 acres. Friends of Big Muddy, a group of dedicated volunteers, has since 1997 assisted the refuge in volunteer stewardship and education programs to advance the partnership and restoration goals of the Big Muddy Refuge. From trail building and tree plantings to nature walks and river clean-ups, the Friends of Big Muddy provide support throughout the length of the refuge. Find out how you can play a part in the future growth of this organization at the March 10 Big Muddy Session at Bryant Cabin. Tom Bell started his first job with US Fish & Wildlife Service in 1974 at Mingo National Wildlife Refuge in southeast Missouri. He's worked at Squaw Creek NWR (northwest Missouri), Port Louisa NWR on the Mississippi River in Iowa, and Litchfield Wetland Management District in central Minnesota. He returned to Missouri in 1999 to be Refuge Manager for Big Muddy NFWR, and has safely navigated the refuge through a period of extensive growth. The talk, hosted by Friends of Big Muddy, Missouri River Relief and the Big Muddy NFWR will be held at 7 p.m., March 10, at the Bryant Cabin at the Overton Bottoms North Unit of the Big Muddy Refuge. Named after J.C. Bryant, the original manager for the Big Muddy refuge, the cabin was acquired by the refuge in 2007 as part of a 500 acre parcel they purchased to add to Overton Bottoms North. It was built to be used as a hunting cabin by the former owners. However the term "hunting cabin" doesn’t do justice to this beautiful, 2,000+ square foot, three bedroom house with all hardwood interior paneling and a huge deck overlooking the Missouri River floodplain. It makes a perfect meeting place for Friends of Big Muddy and we are grateful to refuge staff for allowing us to use this facility for our programs. To get to the Bryant Cabin, take the Overton/Wooldridge exit off I-70 (exit #111, the first exit west of the Missouri River bridge at Rocheport). Go north about 300 feet to the "T" intersection and turn left on Highway 98. Go west seven tenths of a mile and turn right on Brady Lane (the first road to the right). In six tenths of a mile, Brady Lane curves ninety degrees to the right. Go straight on the gravel drive, going past the Loesing parking area and through the open gate. The lane follows the ridge around to the cabin. A map is on the refuge web site, and the Bryant Cabin is in the dark "closed area." Just ignore the closed area signs, as you have special authorization for these programs to enter the area. All programs are open to the public. You do not need to be a member of either organization to participate. We hope you can come and learn more about the Missouri River! 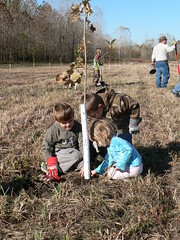 Volunteers plant hardwood trees at Overton Bottoms North Unit of the Big Muddy National Fish and Wildlife Refuge at an event hosted by Friends of Big Muddy and Missouri River Relief. Come to the March 10 Big Muddy Session to find out how you can help in the development of Friends of Big Muddy.